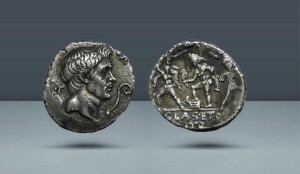 On 38 BC, the Second Triunvirate was living a relatively peaceful period: in Rome, Octavian had just married Livia Drusilla, while Marc Antony lived in Athens his last happy days with Octavia, that calmed him and tried to ease relations between him and her beloved brother. However, the marriage of Octavian meant his divorce from Scribonia, Sextus Pompey´s aunt, and this fact accelerated the breach between them. 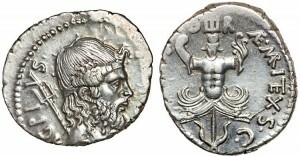 Sextus, son of Pompey, had occupied Sicily for some years as well as Sardinia and the Peloponnese having been appointed as governor by the Treaty of Misenum in 39 BC. Sicily was the main grain supplier of Rome, and it was the last stronghold of the republican resistance. 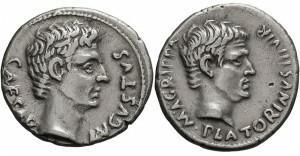 Sextus was a source of conflict for the Triunvirate, as he often stopped the supply of grain, causing hunger in the capital city of the Empire. On 38 BC, Octavian started war against Sextus, but the campaign was a disaster and had to call back the boats due to bad weather. Octavian called Lepidus and Antony for help, but when Lepidus didn´t show up, Antony returned to the East. Octavian, seeing himself neglected by the other triunvirs, focused on the construction of a new fleet, leaving in command his great friend Marcus Vipsanius Agrippa, that had just arrived from Gaul where he had obtained great military success. Agrippa, grand strategist and great as field commander, built an inner harbor, Portus Iulius, that connected Lake Avernus and Lake Lucrinus and this to the sea. This port could´t be seen from the sea, which was frequently sailed by Sextus´ ships, and was used secretly to train men in naval special warfare. They could experiment with a new weapon invented by Agrippa himself, the harpax, that improved the traditional corvus. Octavian joined him, leaving Maecenas in charge of Rome and Italy, even though he didn´t hold public office. He called again for help of the other triunvirs. Antony, thanks to the intervention of Octavia, sent 120 ships to Tarentum in exchange for 20.000 soldiers to be used in his Partian War. Lepidus also sent help, and this way, the Triunvirate powers were renewed fot 5 more years. On 36 BC, Octavian, Agrippa and Antony launched a triple attack against Sextus Pompey. Once again, Octavian was near death in the Battle of Taormina, where he was defeated. Agrippa defeated Sextus in the Battle of Mylae, and later, on September 3, in the Battle of Naulochus. In front of Naulochus promontory, Agrippa met Sextus’ fleet. 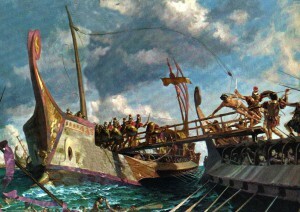 Both fleets were composed of 300 ships, all with artillery, but Agrippa commanded heavier units, armed with the harpax. Agrippa used his new weapon to great effect, succeeding in blocking the more maneuverable ships of Sextus and, after a long and bloody fight, in defeating his enemy. Agrippa lost three ships, while 28 ships of Sextus were sunk, 17 fled, and the others were burnt or captured. 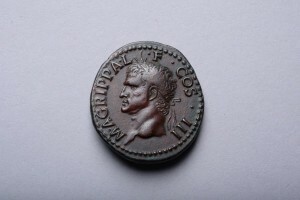 Octavian made Agrippa consul in 37 BC, an unaffordable office for someone lowly as Agrippa. He was also given numerous properties, and was granted the hand of Caecilia Attica, daughter of Titus Pomponius Atticus, great friend of Cicero. The Battle of Naulochus is of decisive for the Roman Empire: on one hand, it meant the end of the Republican resistance, and on the other hand it meant the disappearance of Lepidus, leaving the world in the hands of two men: Octavian in the West and Antony in the East.